The most popular place to visit in Paris is the Eiffel Tower which was originally built in 1889 and for 41 years it was the tallest man-made building in the world until the Chrysler building was built in New York. I don't know of any kids that would not want to go up the Eiffel Tower! It is 320 m high and when you're up there in the wind you might find its ways a little bit this is quite normal. 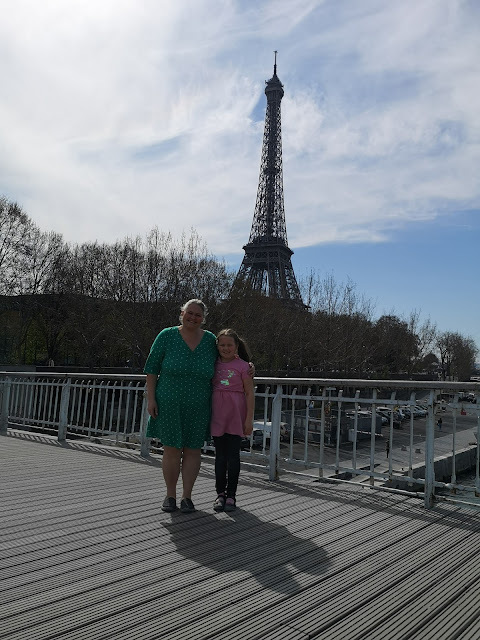 It cost me €25 for an adult to go to the summit of the Eiffel Tower and about €7 for Matilda to go to the top, this was using the lift because there was no way I was walking up there. once you're up there the views are bloody amazing the whole of Paris just looks so white because of the buildings and everything looks so tiny. Matilda was stunned by the view and you get to spend as much time as you want right up at the top there's even a champagne bar so if you're going for a special occasion you can grab a glass of lemonade or champagne while you taking the view. There is a restaurant on the first floor that anybody can use but we didn't have time to stop for lunch. There are some souvenir shops at the top of the tower. But they can be quite pricey and you can buy lots of souvenirs from the settlers outside the Eiffel Tower where Matilda got five Eiffel Tower keyrings for €1. 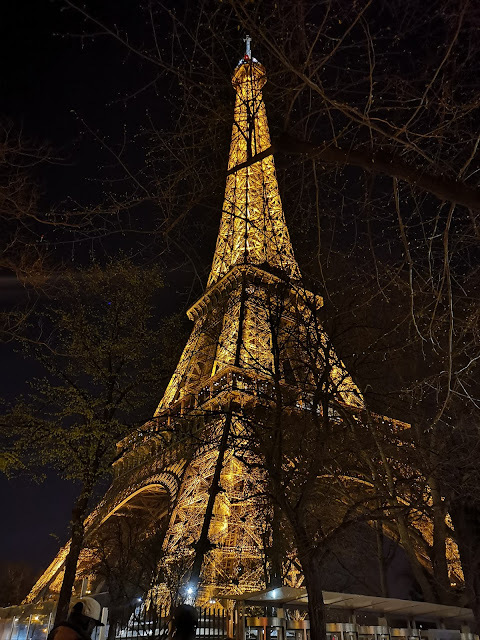 The Eiffel Tower is open every day of the year from 9:30 a.m. till 11:45 p.m. but between 14th of June and 31st of August it's open from 9 a.m. till 12:45 a.m. so you get to see the Eiffel Tower in the daytime as well as at night. The Avenue des Champs-Elysees is a must see place to visit in Paris with its beautiful tree-lined avenue of exclusive shops as well as everyday shops and or exclusive shops, and it is the place where major events in Paris take place like the Bastille Day military parade and it's where the cyclists arrive on the Tour de France. 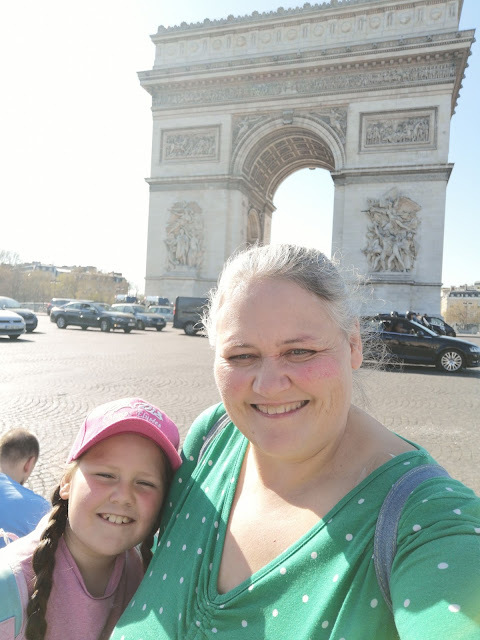 At one end of the Champs-Elysees, you will find the Arc de Triomphe. The Arc de Triomphe is one of the most famous monuments in Paris and it Stans at the centre of Place Charles de Gaulle. It honours those people who fought and died for France in the French Revolution and Napoleonic wars and inscribed on the inner and outer surfaces are the names of all the French victories and generals. beneath it is the tomb of the unknown soldier from World war one. It really is an iconic part of Paris. At the opposite end of the Champs-Elyse, is Place de la Concorde, the old city square where a guillotine was erected in 1789 and public executions took place. one of the famous figures who has been guillotined on this site is Queen Marie Antoinette. you will also find to fountains in the Place de la Concorde, as well as the obelisk of Luxor. The Cathedrale Notre Dame de Paris has been made more famous with the story of the hunchback of Notre Dame and later the Disney film of the same name. So most kids know of Notre Dame before they even visit it. Not only of the story but the architecture too, as we approached Notre dam recently Tilly pointed out the gargoyles that cover Notre Dame. But there is so much to Notre Dame de Paris than just the stories. 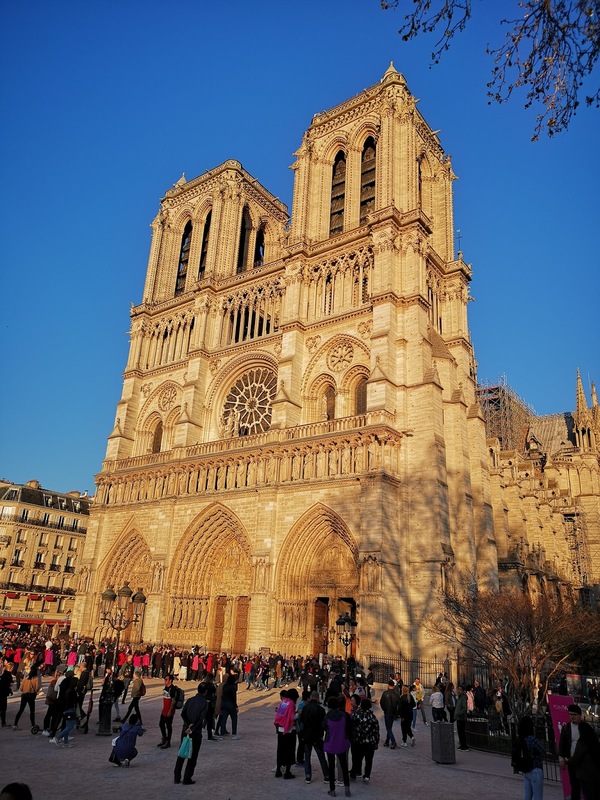 Did you know it took 100 years to build it was started in 1160 and finished in 1260 and has been modified a few times throughout the centuries and sadly during the French Revolution in the 1790s it was amongst one of the buildings that were damaged. But after Victor Hugo's novel was written in 1831 there was a new interest in Notre Dame de Paris. 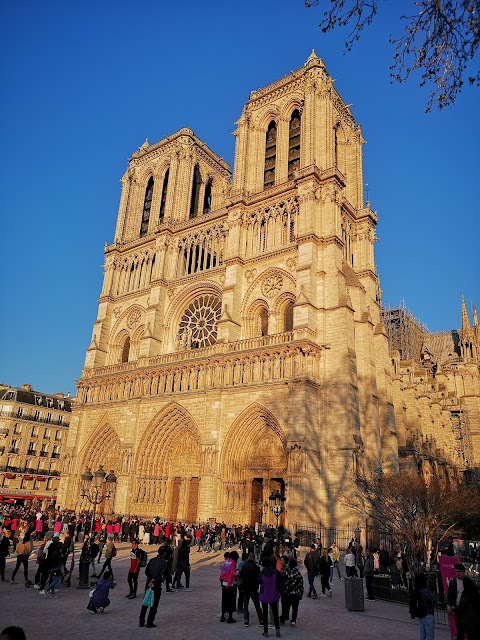 you can go inside Notre Dame de Paris for free all day they do ask for donations and anybody can join in a church service that is happening on your visit. We joined in with mass when we went and although it was in French there was an English translation in the pamphlet that we've been given and religion is the same whichever country you're in. There was something so incredibly special about sitting in a church service. The glass windows are amazing and you can climb the towers too. 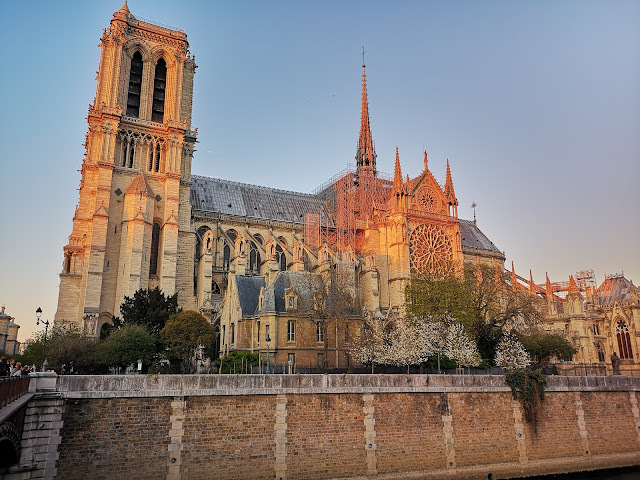 The Cathedrale Notre Dame de Paris is open every day from 7:45 a.m. to 6:45 p.m and 7 15 p.m on Saturdays and Sundays, so if you only have a day in Paris make this one of the last attractions that you visit you get to see it in the sunset then and it's covered in a beautiful orange glow. The Louvre museum is the world's largest art museum and it is housed in the Louvre Palace which was built in the 12th or 13th century. It was initially built as a castle and as the city expanded through the centuries the castle lost its functions to be defensive. So it was converted in 1546 by Frances the first to become the main residence of all of the French kings. 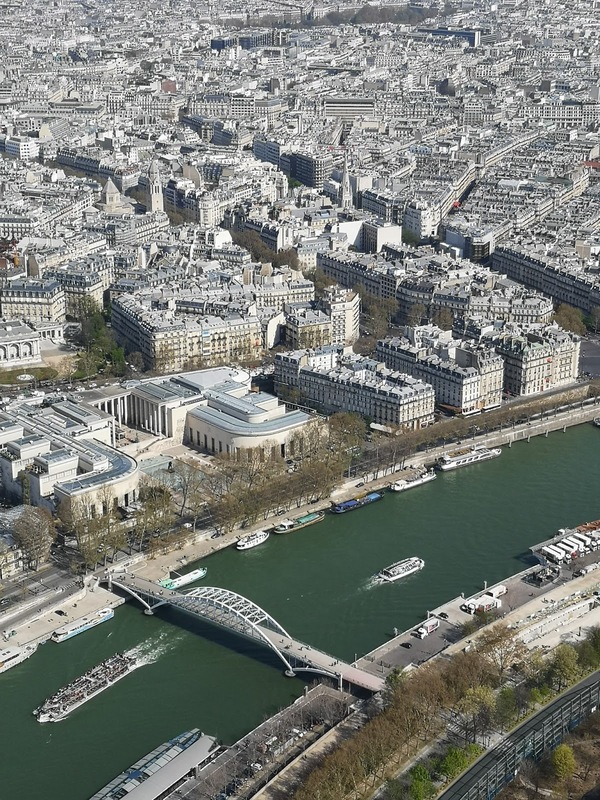 The Louvre became a museum in 1793 when it hails 537 paintings that belong to the royal family and church property that had been confiscated but after Napoleon's abdication, everything that had been seized by his armies was returned to the original owners. 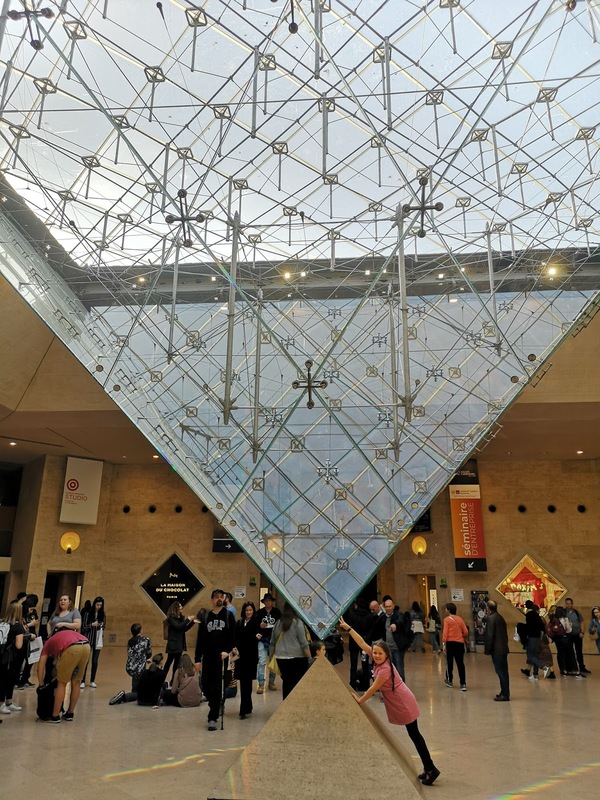 These days the Louvre has a huge glass pyramid that stands proudly over its main entrance and this year it celebrates its 30th birthday. 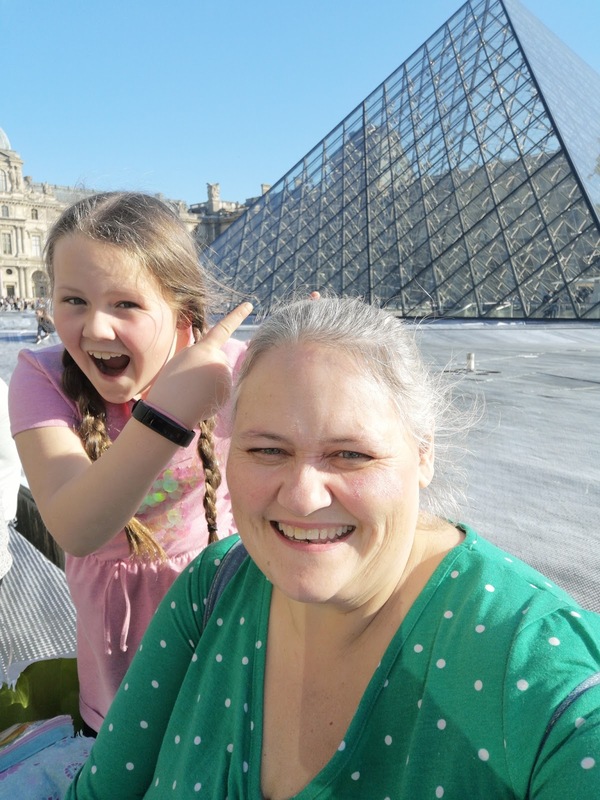 It is €15 to go into the Louvre and kids are going free and as you go underground to get to the entrance of the museum there is also an inverted pyramid that hangs from the ceiling. The Louvre is where you will find the famous Mona Lisa painting. 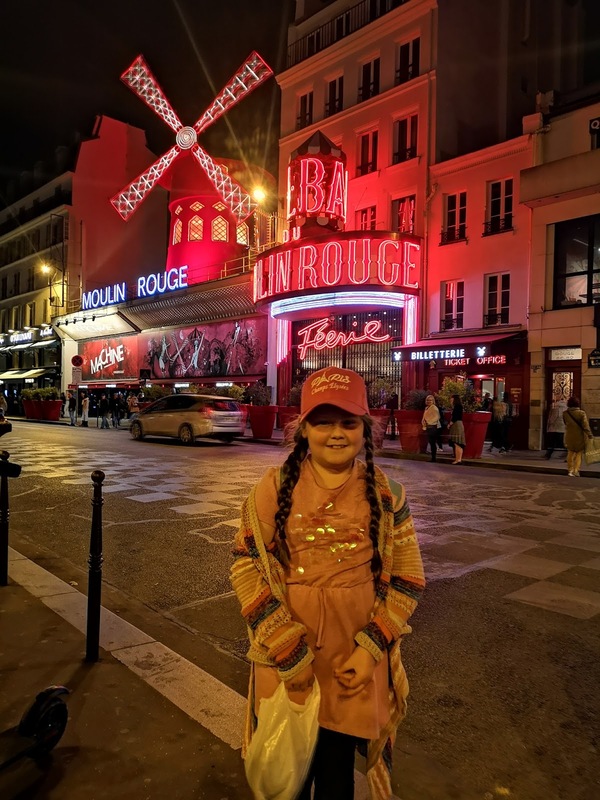 Although Moulin Rouge is not a place you could probably take your kids into, it is the most beautiful site if you go and see it after dark whilst it's all lit up. Moulin Rouge was a cabaret house founded in 1889 and was the birthplace of the more modern form of the can-can dance. In its day it was used as a place where courtesans word seductively dances for the visitors to the building. These days it is a tourist attraction offering dance entertainment for visitors from around the world and inside the club, you can see much of the clubs decor is a still as romantic as ever. Although the original building was destroyed by a fire it was rebuilt and has seen the likes of Frank Sinatra, Ginger Rogers, Liza Minnelli perform there. It's well worth a visit in the dark to see the Moulin Rouge in all its lit up glory. of course, there are so many other places to visit with kids and it will depend on what your budget is and how long you're there for. Matilda's favourite place was the Eiffel Tower, but she equally enjoyed herself the other places we visited too. 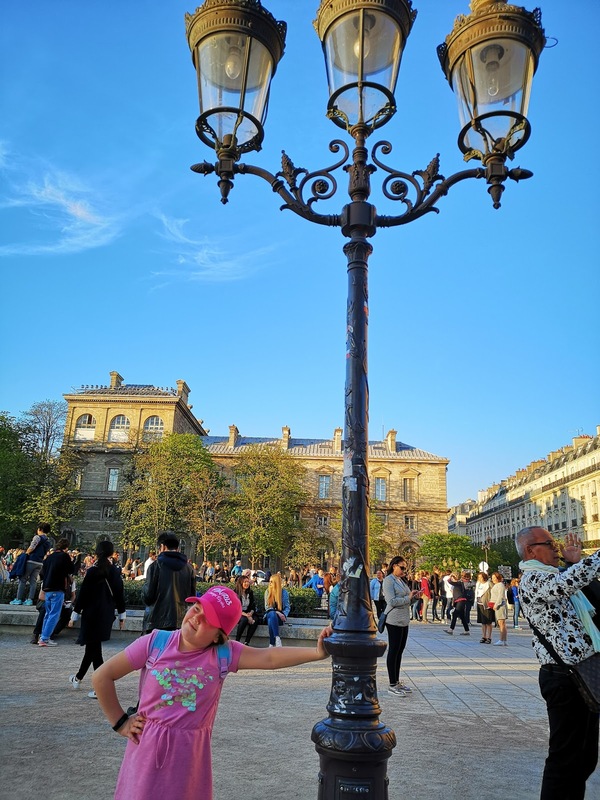 If you haven't taken your kids to Paris you should do!